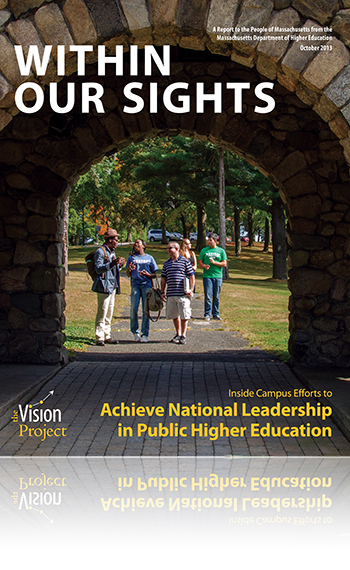 Released October 21, 2013, Within Our Sights: Inside Campus Work to Achieve National Leadership in Public Higher Education is the second Vision Project annual report. Within Our Sights highlights initial signs of progress in the efforts of Massachusetts community colleges, state universities and UMass campuses, in keeping with the Patrick Administration's commitment to invest in public higher education, to graduate more students and better prepare them for jobs in the Commonwealth's knowledge-based industries. Delegations representing all 29 of Massachusetts’ public college and university campuses attended a statewide Within Our Sights conference on Friday, October 18, and received a sneak preview of the report. The conference featured keynote speaker Freeman A. Hrabowski III, president of University of Maryland, Baltimore County, and nationally renowned expert on closing achievement gaps, and showcased exemplary campus work that is advancing the goals of the Vision Project.